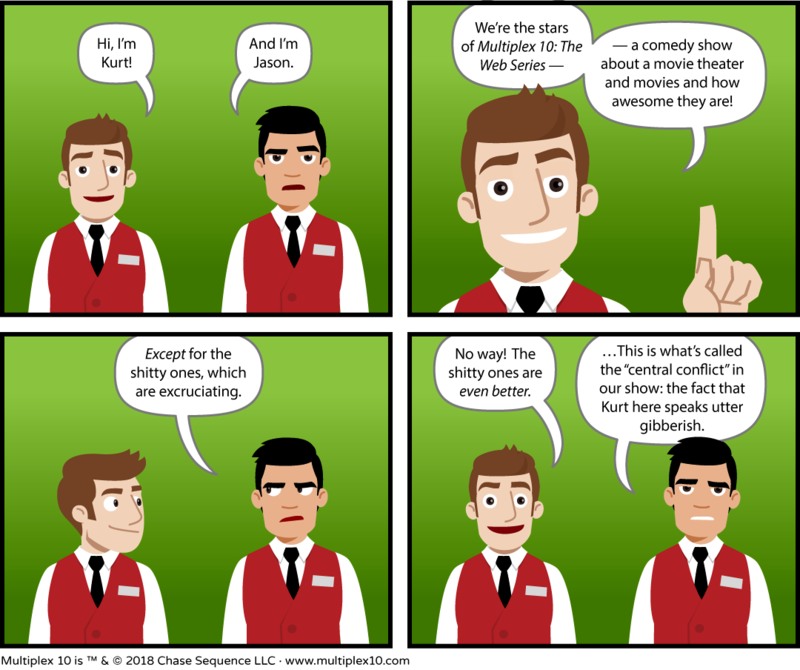 While anybody coming to this website very likely already knows these two hooligans, in order re-re-re-introduce Kurt and Jason to potential backers around the Internet, I made this comic. And I’ll be doing a few more as we get closer to the deadline. Who doesn’t like more Multiplex 10 comics? NOBODY, that’s who. If you haven’t already, please consider backing the Multiplex 10 project as early as possible! The closer we get to deadline, the more important it is for us to look like we’re in striking distance of the goal. Because we do have a very good chance, if my past Kickstarter are any indication, and it would be fantastic to be able to fund longer or more complicated episodes, or more than just the five web series episodes and five reviews. The more money we raise, the better we can make Multiplex 10. We’re definitely going to do a Becky/Melissa spotlight episode that’s more of a direct sequel to the animated short. One of them will be a horror-themed episode that we hope to be able to submit to horror film festivals afterwards. What do YOU want to see Multiplex 10 touch on in upcoming episodes? Any genres or upcoming movies releasing this fall/winter that you’d like to see us make fun of in a web series episode or review in a Movie Minutes episode? Let me know on Facebook, Twitter, or wherever. Next Next post: Multiplex 10 Kickstarter Prize Pack Giveway!